Toby and Kelly have been working feverishly on their Christmas wish list for parakeet-Santa. They are cutting it a little close to the wire, but here’s their parakeet gift list full of their secret and most closely held desires! Toby really wants to try having Nutriberries as a treat! She has heard that if I crumble them up for her she will be in a heretofore unknown ecstasy of foraging. Kelly’s wants are a bit more basic. She plows through a cuttlebone every week, so she would like a never-ending supply of essential calcium as well as beak-exercising destruction. Kelly snuck in a second want in a row! She loves the smaller version of this toy so much that she wants to try out the one for big birds! Since the single cupcake style is destroyed in a single day, we’re hoping that Santa brings one that lasts for three days! Both Toby and Kelly are dreaming of a new play gym. 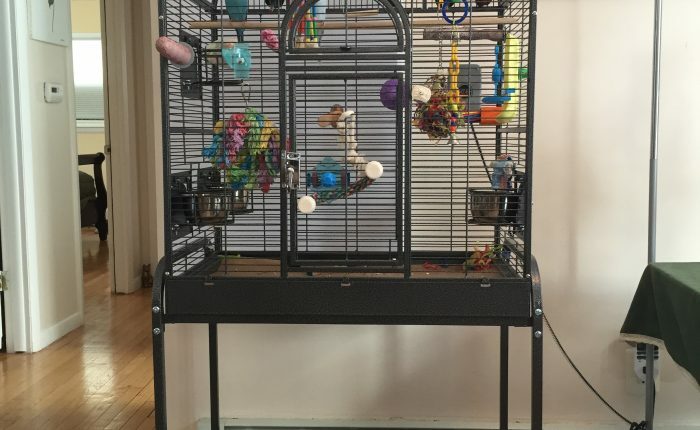 They acknowledge that they previously had a very similar gym and totally ignored it, but they feel that since they both have flat top flight cages now they will get a lot more use of out of a play gym if it’s on top of the cage. You’re probably wondering what poor new kid Kevin would like for Christmas. He’s just dreaming of getting out of quarantine and spending some time with his “sisters”. 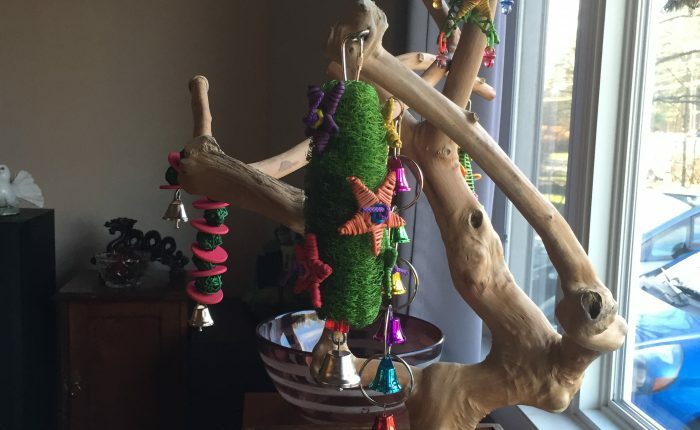 He has been using the java tree as his personal play stand, so we all hope he comes out of quarantine in time for us to use his play tree as our Christmas tree like we did last year! Speaking of which, Santa better bring us some new Christmas-themed bird toys to load up our “tree”. Seems like some human “Santas” may need to start adding things to their carts before we run out of time! I hope everybirdy out there finds exactly what they most want and need under their trees this year! When we first got Toby I was pretty convinced that mirrors in cages were a bad idea. There’s tons of anecdotal evidence that having a mirror in the cage greatly reduces the likelihood that your new parakeet will bond with you. This is because they think the bird in the mirror is a part of their flock, and a non-tame budgie will almost always prefer the company of his own kind. Bonding with a mirror bird can mean the budgie will spend hours a day singing to the mirror, bopping heads, and potentially even attempting to feed the mirror through regurgitation. This kind of bond can make the budgie unmotivated to ever come out of the cage and interact with you. I mean, why would he want to if his best pal can’t come out too? It may also make the budgie more territorial and protective of his cage, if he thinks he’s defending another bird. 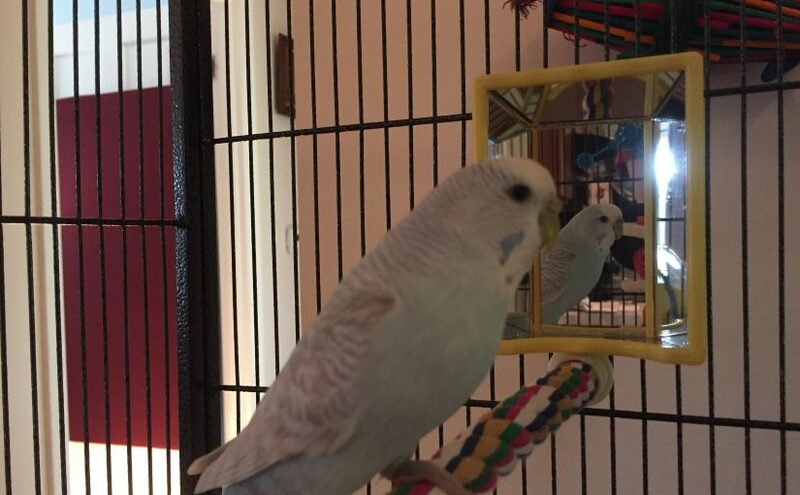 In some extreme cases, attachment to a mirror can result in a budgie getting stuck in a feedback loop. In that instance, since the mirror budgie never breaks the loop of action and reaction, the real budgie can interact with the mirror to the detriment of their own health; potentially resulting in dehydration and starvation. Now, that’s super extreme. I would not expect that to happen to 99% of budgies with mirrors. But, I would anticipate that the vast majority of solo budgies’ ability to be tamed would be impacted by a mirror friend. When bringing home a new budgie I would recommend leaving mirrored toys off your shopping list. All of those warnings aside, we did recently get a mirror for Toby and a mirror for Kelly as a bit of a trial run. I’ve been feeling increasing bad for Kelly since she and Toby split up, she’s clearly lonely in the cage and I was worried about her becoming depressed about not being able to get to Toby. Since we can’t get a new roommate for Kelly until November due to my travel schedule we talked about it and decided to try adding a mirror so she wouldn’t feel as alone. Toby got one too because that’s how we roll, like giving your kids an even number of presents on the holidays, you can’t do for one without doing for the other! I’m pleasantly surprised by the experiment so far. Neither parakeet has gotten overly attached to their mirror bird. Kelly spends some time hanging out near hers daily singing to it, but hasn’t gotten too into interacting. Toby plays with the beads on her mirror and occasionally seems interested in what she sees, but typically gets distracted in short order and wanders off to play with something else. There’s been no impact on their readiness to come out of the cage when the doors are opened, which may be because there’s a real bird to come out and play with. Neither bird has gotten more territorial than they already were about their cage either. Although to be fair they are quite territorial anyway! 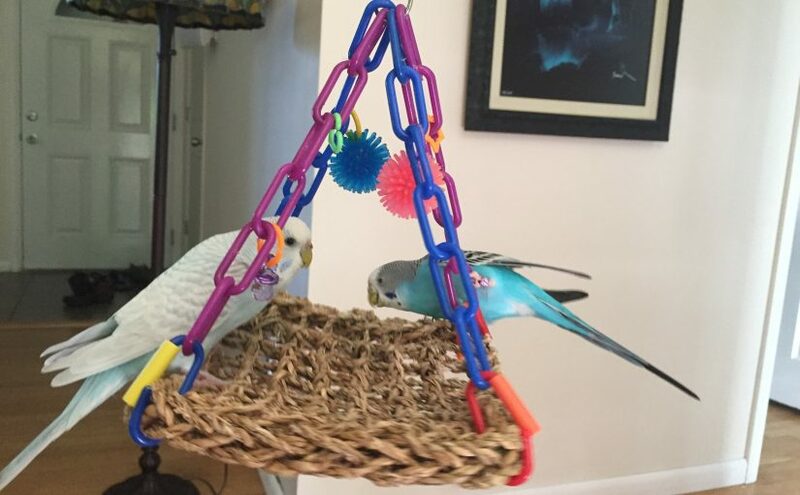 With so many toys out there in the marketplace it can be tough to choose for your budgies. I know I’ve made tons of mistakes buying toys that were way too big, or worse, dangerous. It can be difficult to look at pictures on the internet and know what to buy for mental and physical stimulation. 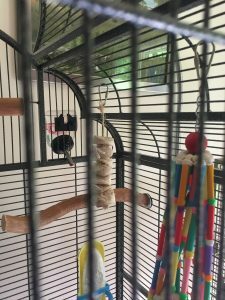 Here are Toby and Kelly’s recommendations for best toys for parakeets, all of them are either currently in their cages or were and were so well-loved they no longer exist! 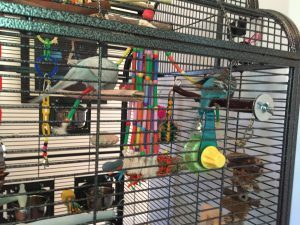 Super Bird Creations Wind Chimes Toy for Birds – Toby and Kelly love this toy so much I’ve already written not one, but two reviews of it! They can be found here and here. This toy can be played with in multiple ways, preening, chewing, attacking, moving the straw “arms” and it has several levels. If installed with a perch midway down the parakeets can burrow into the center of the straws (where there is a bell to reward them! ), and the ends of the straws with their shoelace ties provide a totally different play opportunity. Toby and Kelly also enjoy launching themselves at it and clinging to the red ball at the top. Bonka Bird Toys 1925 Cake Bird Toy – this toy is, without a doubt, Kelly’s favorite toy of all time. The problem is that she destroys is in a single day! This has happened on to occasions, the first of which I recorded in a review. It’s still fun to play with after the destruction of the sola wood, the cupcake liners are totally a toy in their own right, but I mostly recommend buying this toy for special occasions like hatch days or gotcha days. 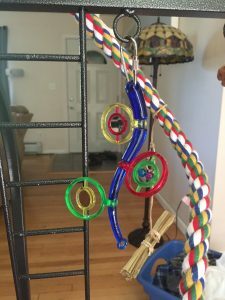 JW Pet Company Activitoys The Wave Bird Toy – These relatively inexpensive plastic toys made by JW Pet Company are some of Toby and Kelly’s favorites, and this is one of them. I avoided buying them anything with a mirror for a long time. I was worried, especially when Toby was a solo parakeet, that she would end up in a feedback loop with her own reflection and never think to eat or get a drink of water. I think that’s less of a concern with these small round mirrors, they may catch an intriguing glance of “another” parakeet in the mirror, but it’s not enough to start trying to interact with. The mirrors also rotate and there are fun little beads to chew and the whole thing is light enough that they can grab it and bang it on something else, which is always a good time! You could also hang something else from the bottom if you wanted a very long toy. Kelly saw herself in a mirror for the first time in this toy, I managed to get a very cute video (unfortunately this was before I learned to take all videos “side to side so the margins are wide” I apologize!). Wesco Pet Original Bird Kabob Shreddable Bird Toy – Deceptively simply in its design this toy provides days and days of shredding fun. Chewing is extremely important for parakeets beak health and mental health. They are born and designed to chew and destroy. These are made of a soft wood, but still take a lot of work to get through, versus something like the bonka 1925, which is very quickly shredded. They come strung on a rope that can be untied if you want to add one of the “donuts” of wood to another toy or put them on a metal skewer instead. Toby and Kelly’s interest in this toy waxes and wanes, but there’s always a Wesco Shreddable Bird Toy of some sort available to them. 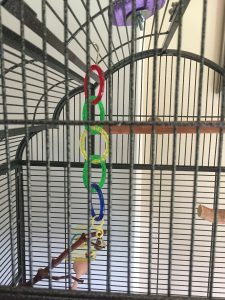 JW Pet Company Activitoy Olympia Rings Small Bird Toy – This is another one of our favorite inexpensive JW plastic toys. I think I bought this back in 2005 and it’s always been in a cage or on the play gyms. It’s a classic and a must have, and another toy that can be played with in a few different ways. Toby likes to grab the bell at the bottom and shake it vigorously, or climb from the bottom to the top. She also will grab one of the rings and use it to stabilize her foot while she grooms herself. Kelly, on the other hand, likes to go through the rings over and over again in some very “Olympic” gymnastics! At first I was worried she would get stuck but it seems like they are the perfect size for such antics. This toy is also really easy to clean up, a huge plus for something that’s going to be around for several years. 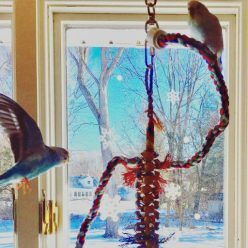 This last toy is a bit of a toy/perch hybrid, the Super Bird Creations Mini Flying Trapeze Toy for Birds . But with so much going on I think it has earned it’s way onto our top six toys! There is sea grass to rip apart, plastic links to climb and chew, and these great tiny plastic toys to reach for and try to destroy as well. My only caveat is I would not give this to female birds in breeding condition, as they may regard it as a possible nesting space. Also since it’s got a rather large footprint they can get very territorial about it and we’ve had some associated squabbles. There you have it, Toby and Kelly’s recommended best toys for parakeets. 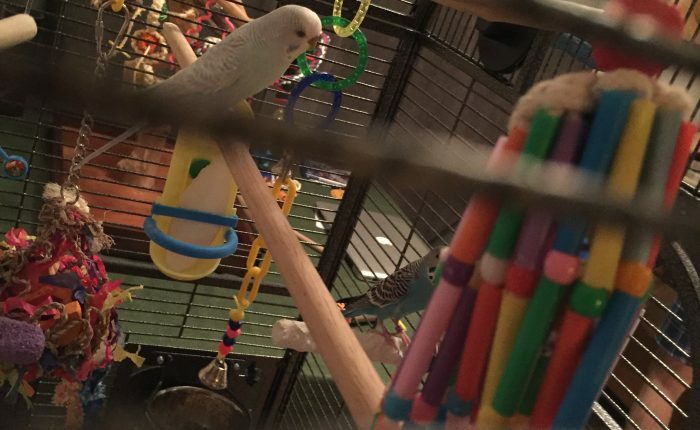 They have all been “road tested” in our home and I feel comfortable guaranteeing that even if they aren’t your parakeet’s favorites they are at least appropriately-sized and safe for your budgies. I’d love to hear some of your favorites, please leave a comment!